At the Larz Anderson Museum Show, in August, 1998, I was beguiled by a strange and elegant British frame, an E.G. Bates. It has wildly decadent, baroquely ornate lugs, somewhat reminiscent of Hetchins, and is truly a thing of beauty. 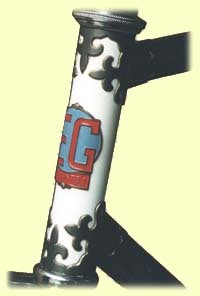 "EG Cycles" which was E.G. Bates, 591 Barking Road, Plaistow. Both were in prime form in 1950's." 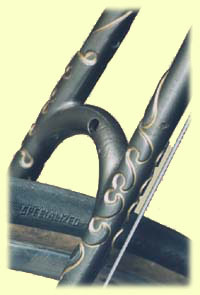 At first glance, it appeared to be a track frame: The rear fork ends opened to the rear, as with a track bike, and the front fork had round, not oval blades, which is also characteristic of track bikes...but it also had eyelets for fenders (excuse me, "mudguards") and was drilled for brakes. On closer examination, the tire clearances were much more generous than they would be on a track bike. I concluded that it was a fixed-gear road frame. It was close to my size, so I snapped it up. On further examination, I'm more inclined to think that it was a club bike, probably made for use with a Sturmey-Archer hub, or perhaps with a flip-flop hub. When was this bike made? Were there many others like it? What sort of equipment would it have been likely to have had when it was new? 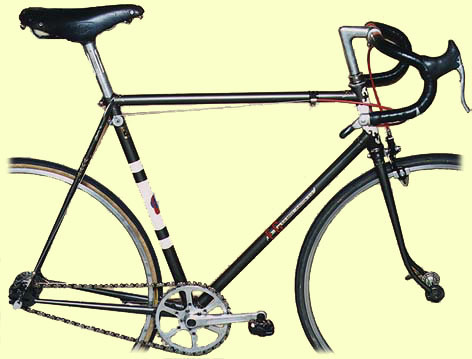 I stumbled across your web site during discussions with a colleague in the office concerning old cycling matters and can perhaps give you some background information about the bike in question, as I had one just like it, built for me in approx. 1960/1. My father, W.A.Smee was a member from the 1930's of an East Ham, London cycling club named Roamer C.C., in which he rose to the position of Vice-President. A fellow V.P. in the fifties, and later President, was E.G. "Eddie" Bates, who owned a large cycle shop in Plaistow, which specialized in hand made racing machines. Eddie's son Alan was a very prominent racer for Roamer, winning the "All Rounder" competition for the seasons best time/distance for 50 miles/100 miles/ 12 hours. in 1961 I believe. Other famous names doing guest races in the club's colours included the World champion, Beryl Burton. You were asking about the type of equipment originally fitted. Obviously this varied, but I can just about remember most of what I used. (It is a very long time ago ) As I have said, my frame was an identical E.G.Bates with track ends but with only the front fork crown drilled for a single brake. For road time trials I used Ambrosia alloy bars and extension. The chainwheel and crank was Chater-Lea. (At the time more expensive than Campagnolo but with a great tradition for track work.) Wheels were Weinmann rims with Campag L/flange hubs. Saddle was Brookes B17 Sprinter. I went to live in California in the mid sixties in my late teens and my cycle racing with Roamer C.C. had already ended by that time. Your web site pictures certainly brought back a lot of memories. They always were the most beautiful bikes. I hope the above has been of some assistance.